Samsung Galaxy J7 V Price, Review, Deals, Cost, & Sales! Home / Compare Cell Phones / Samsung Galaxy J7 V Price, Review, Deals, Cost, & Sales! 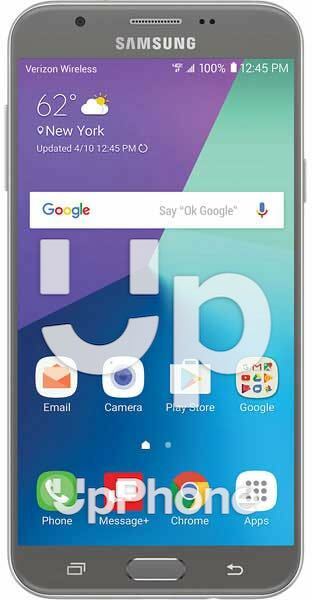 The Samsung Galaxy J7 V is a rendition of the Galaxy J7 but is designed exclusively for Verizon. It is equipped with a 5.5" IPS LCD 16M colors, 720 x 1280 screen resolution and 267-pixel density. While the Samsung Galaxy J7 has the fancier 5.5" Super AMOLED 16M colors, 720 x 1280 resolution and pixel density of 267. The J7 V has an 8 MP rear camera capable of recording HD videos @ 30 fps. It also has a 5 MP front camera. For the storage, the J7 V comes with a 16 GB internal drive with support for up to 256 GB expansion slot via microSD. The Galaxy J7 has the same storage and supports the same 256 GB expansion. This device has a side-firing speaker located and the top half of the right side. Audio quality is good but not that loud. The J7 V runs on Qualcomm MSM8953 Snapdragon 625 with eight cores. Performance is ok while there are faster ones out there but the powerful chip does a good job of keeping lag times to a minimum. While the J7 has the Qualcomm MSM8952 Snapdragon 617 Exynos 7870 Octa with eight cores. Powering the device is a huge 3300 mAh battery. It can hold conversations for up to 40 hours via 3G, standby time of up to 288 hours and 156 hours of music play. This device has a pre-installed screen protector right out of the box. The V in Galaxy J7 V stands for Verizon. This device is equipped with an FM Radio. Comes with color black only.